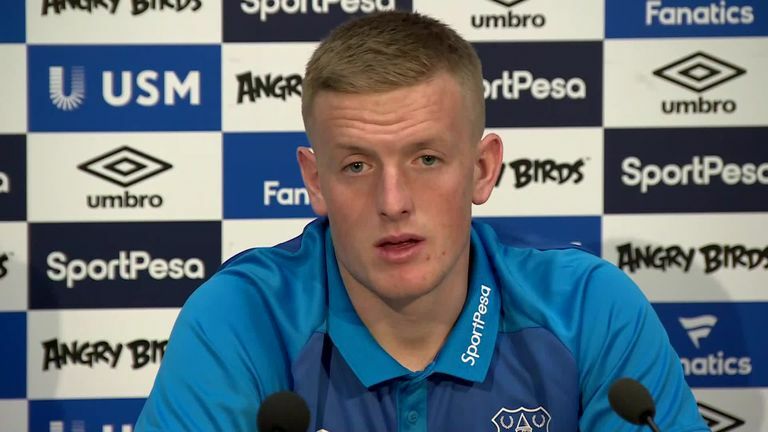 Jordan Pickford says he refused to let speculation linking him with a move away from Everton affect his focus and performances for the club. The England No 1 this week signed a new contract with the Toffees, having joined from Sunderland for £30m last summer in a record fee for a British goalkeeper. After a standout campaign saw Pickford inspire England to their first World Cup penalty shootout victory on their way to a first semi-final in 28 years, the 24-year-old attracted interest from a number of high-profile clubs including Chelsea. "You've just got to keep performing and put that to the back of your mind," Pickford said. "You just don't let it affect you - even if you see speculation. I just knuckle down and focus on my game, that's how I do it. Having kept 10 clean sheets in his first season at Everton, Pickford credits his move to Goodison Park from Sunderland as key in his journey to becoming England's No 1. "If I didn't come to Everton I think I would have been with Sunderland - that's my hometown club and if this wasn't here I probably would have been there still," he said. Everton and England No 1 Jordan Pickford says his head was never turned, after his stand-out World Cup displays attracted interest from Chelsea. "To come to Everton, with the progression I have made within a year, gave me the opportunity to be the No 1 for England at the World Cup and it's great, but now the next step is to become even better - better for me, better for the club and better for England." Despite shining with his match-winning displays in Russia, Pickford insists his position between the sticks for the Three Lions is far from concrete, as he stressed the squad's strength in depth. "I don't think anyone is ever established as anything," he said. "I think for me I've just got to keep working hard at Everton… being a match winner for Everton, and hopefully that will take care of England. "The competition is great for every position, really. "If you look at the squad in depth, there are people who are not in the squad this camp who could be in the squad next camp. "The squad collectively will improve, but it will also improve myself as an individual."